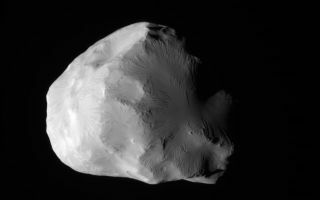 NASA's Cassini spacecraft obtained this unprocessed image of Saturn's moon Helene on June 18, 2011. In this space wallpaper, NASA's Cassini spacecraft has successfully completed its second-closest encounter with Saturn's icy moon Helene, beaming down raw images of the small moon. At closest approach, on June 18, Cassini flew within 4,330 miles (6,968 kilometers) of Helene's surface. It was the second closest approach to Helene of the entire mission. Cassini passed from Helene's night side to the moon's sunlit side. It also captured images of the Saturn-facing side of the moon in sunlight, a region that was only illuminated by sunlight reflected off Saturn the last time Cassini was close, in March 2010. This flyby will enable scientists to finish creating a global map of Helene, so they can better understand the history of impacts to the moon and gully-like features seen on previous flybys.